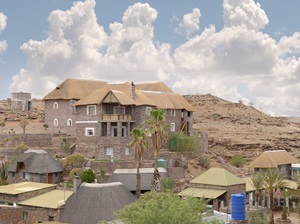 Category Archives: "Fish River Canyon"
This small old-world stone hotel nestles in rustic splendor and the shade of ancient palms, and offers a refreshing change from the hustle and bustle of modern living. Recently renovated, the hotel boasts all the comforts of quality hotel accommodation without losing any of its authentic qualities. 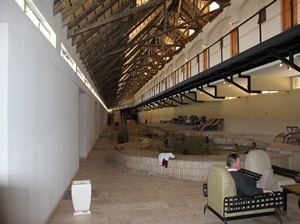 The new Seeheim Hotel offers 16 en-suite single, double and family rooms a dining and breakfast room, a swimming pool and outdoor recreational area with barbeque, a well stocked bar, TV (M-Net and DSTV), a shop with basic necessities and curios, and a petrol and diesel outlet. 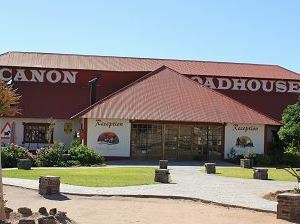 Due to its elaborate décor Cañon Roadhouse has acquired a sort of cult status in Namibia: the good old days of the automobile are celebrated in the theme restaurant and bar. Situated directly on the road to the Fish River Canyon Cañon Roadhouse offers 24 immaculate en-suite rooms, a swimming pool and a petrol station. For alfresco fans there are beautiful camping sites which allow for privacy. Enjoy a slice of our legendary Amarula cheesecake among coachwork arranged with loving care. The geology, flora, fauna and history of the area are explained on display boards at the Canyon Information Centre. 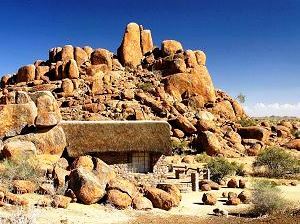 Tall weather-beaten granite boulders mark the location of the lodge and form an integral part of the overall design. 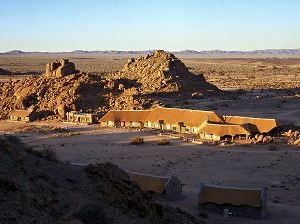 Spaced evenly amongst these boulders are 26 thatched, wooden bungalows all equipped with en-suite bathrooms. An old farmhouse, originally built in 1908 by three Bavarian brothers, has been restored to serve as the Canon Lodge Restaurant. The Cañon Village sits picturesquely at the foot of a sweeping rock face. The lodge consists of 21 comfortable chalets (42 rooms) in the Cape-Dutch style and a thatched restaurant of generous proportions is grouped together to form a little hamlet. A rural atmosphere also prevails in the restaurant building which sports a coffee shop and a rustic bar between massive granite boulders. The evening buffet consists of several meat dishes, fresh vegetables and a choice of salads. Meat and sausages, yoghurt and cheese, vegetables and fruit all come fresh from the Canyon Village self-sufficiency centre which runs a greenhouse, cheese dairy, butchery and smokehouse. Namibian artists have adorned the walls of the restaurant and the chalets with murals depicting the daily life of the Bondelswart Nama, the original inhabitants of this area. On arrival Luggage and Suitcase, the donkeys will welcome you and happily deliver your luggage to your chalet. 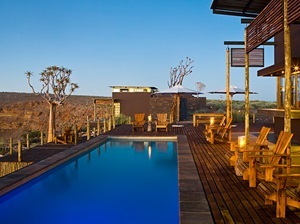 Fish River Lodge and Canyon Nature Park are constantly assessing practices that ensure that they leave only the lightest footprints on their surroundings. 20 private chalets are dotted along the edge of the canyon, flanking both sides of the main lodge. As with the main building, guests can soak up the enchanting views. The beds have been placed to allow guests a prime spot from which to gaze over the majestic canyon as the sun washes a kaleidoscope of colours over the landscape every morning.